I also joined the link party at Common Ground. How pretty! I love all of the old Valentines and that fan is gorgeous! Thanks for linking up to Gettin' Krafty With It! Just lovely Heather! I'm loving those dishes and to have those old valentines from your Grandmother is precious! It's just lovely, Heather. Having your grandmother's valentines makes it even more special. Have a wonderful day! That is so pretty! Do you leave the stripes in there all year round or change it out? You always do lovely eye candy displays. Enjoy your day! I was wondering if you were going to decorated your beautiful corner cabinet for Valentine's Day...I love it! It looks perfect. Lovely! I love the beautiful vintage Valentines...And they are extra special since your grandmother gave them back to you. Is the above Valentine a plate or is it paper? Whatever it is, I simply love it! Thanks for sharing your decor. This is lovely. I feel like a St. Valentine Day slacker. This motivates me to get crafting! I love those dishes. Are they old? I don't decorate for Valentine's Day but you've done an excellent job. You make me wish I had. Have a great evening. oooooh! I'm all giggly looking at your pretty photos. You know how much I love red and white together and your display is fantastic! Heather, you like stripes like me. Cute cabinet and thanks for sharing this. I Love your display, it is SO Perfect!!! I LOVE the striped backdrop and Every detail... It's such a fun and romantic too! Love all the red and white....I can never get too much red! Such a great idea to decorate this hutch for the seasons! Your cabinet is delightful! 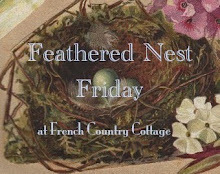 I am visiting from The Shabby Chic Cottage and am happy to have found you! Looking forward to your future posts! Happy Valentine's Day! Heather, you are so fantastic at staging, and each of your arrangements is so completely different from the last. That hutch is always so fresh. Love your corner! How neat to reuse the old cards. Oh how beautiful! 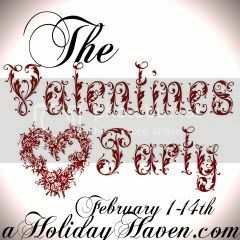 I am visiting via the Valentine linky. I wanted to invite you to the two linky parties I am planning. The first will be on February 23~ High Tea Tablescapes. Details can be found on my Wednesday posts. There will be PRIZES! Hi Heather! 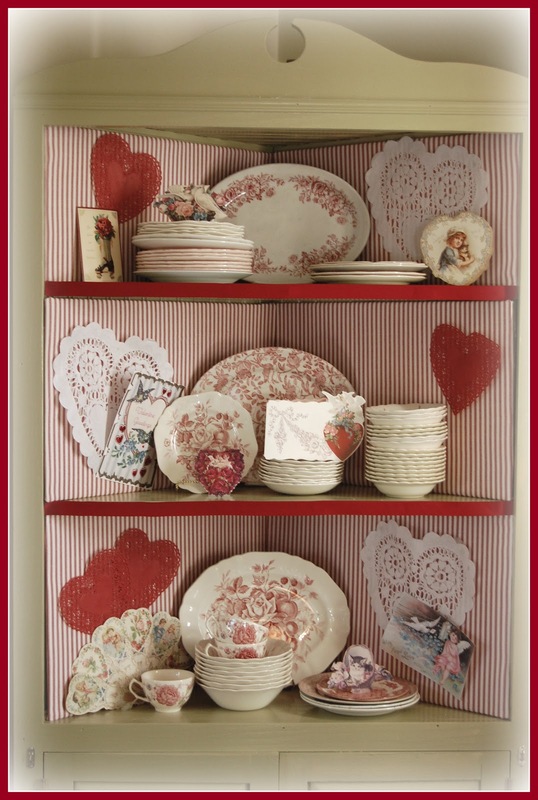 I love love your valentine corner...love all the pieces in there. Happy love day! I just love your little Valentine corner! Beautiful! What a beautiful display. The plates are amazing and graphics ferry has such lovely images. And you combined them into a wonderfully vintage vignette. Thanks for adding this to The Valentines Party! And happy Valentines Day to you. My name is Heather, and I enjoy crafting, sewing,baking,cooking and decorating. Along with my MacGyver husband and three kids, I live in a house originally built in the 1870s. My dream is to someday have a beautiful kitchen where I can cook and entertain friends and family effortlessly! In the meantime, come join me while I share stories and ideas about living in and renovating an old house.